First post - home made TV antenna - don't laugh! My TV watching requirements are simple and not very demanding, as I don't really watch much. I obviously don't know much about antennas! It's made from PVC pipe and 8 ga. copper wire. It worked OK, but the signal has been quite sensitive to weather conditions. I have a lot of trees around the house and I think that, combined with the weather/wind, could be the problem with the variable signals. I have an older DTV, and sometimes I get the characteristic pixellation, and sound cut-outs, but not all the time. Often the signal strength will sit at around 100; other times the same stations vary and go up and down in signal strength. The trees would be very difficult to prune. The branches directly in the signal path aren't that much higher than the antenna. I got my local station info at antennaweb.org and used a compass to orient it; all the stations are about 20 miles away, between 243-244° compass direction, so all the transmitters are pretty close together. I guess this is my question: is it time to bite the bullet and buy a new antenna? Budget is a pretty strong factor right now. I looked at this on on Amazon Amazon.com: RCA ANT751 High Quality Durable Compact Outdoor Antenna: Electronics but have been holding off on it until I try to determine what the real cause is. Firstly, please post a link to your TVFool report. Don't worry, it obfuscates your address for privacy. secondly, I'd like to see the other side of that antenna. The phasing lines appear to be funky. Where is the site that you used? I'd like to look at their directions. I'm thinking that it just might be a matter of the build being the issue. FWIW, I use a 4-bay bowtie 20' AGL, in the middle of a masssive bunch of trees & I rarely have pixelation issues. I'm about the same distance from towers as you are. Awesome, but that's a lot of trees and branches to overcome. I'm pretty sure the antenna I replaced was a Radio Shack VU-90. It was pretty old, and as I recall, I didn't have signal problems with it until it started falling apart. Then the branches that beat on it and finished it off. I didn't think the quality of the build was very good, I believe the plastic parts decomposed from the sun's UV,and that helped lead to its demise. Also, that was "many" years ago, and I'm sure the trees have grown a fair amount since then. I don't know if this has any bearing, but there are tall pine trees with branches about 5-6' behind the antenna. The arrow points toward the transmitters. Edit: I just found this in my attic that I had forgotten. It's in pretty decent shape, except it only has 3 sets of arms, the last (longest) set has broken off. Just wondering if this is worth trying, or will there be problems with the set of arms missing. Good video. In your case CBS is on channel 6 and FOX is on channel 7, according to your TVFOOL report. So those are both VHF, not UHF, so I suppose you would not expect to get those with that type bowtie? Not sure though. ok. Couple of things in that build video. 9-1/2 spacing between bowties is good. But. the bowties themselves should be 10" long for higher gain towards the low end of the UHF band. And those plans are for the old UHF frequencies. The other thing, which is *critical*, is that the balun needs to connect exactly in the middle between the 2 inner bowties. Where he's got it puts the antenna out of phase & wreaks havoc with the SWR. okie, yes, they both come in very well most of the time, in fact 6 is one of the stronger ones. tony, thanks for the info & PDF. I'm inclined to try "no cost" first. Do you get WRGB (CBS) and if you do, do you know what real channel you're pulling in? The main transmitter is on channel 6 (low VHF) but there also appears to be a channel 39 transmitter for the same channel to the north of you. That old antenna from the attic may be worth a try. Too bad it isn't completely intact. You have quite a few VHF stations including that one on channel 6. Do you get WRGB (CBS) and if you do, do you know what real channel you're pulling in? The main transmitter is on channel 6 (low VHF) but there also appears to be a channel 39 transmitter for the same channel to the north of you. Yes - According to the info I got from antennaweb.org, WRGB is assigned to ch. 39. (Just noticed that my antennaweb info I've been using is from 2007. The updated info there is a little different. According to Trip's Rabbitears.info WRGB's display channel on the channel 39 transmitter is 45. Therefore if it shows up as channel 6, it's the main channel 6 transmitter. 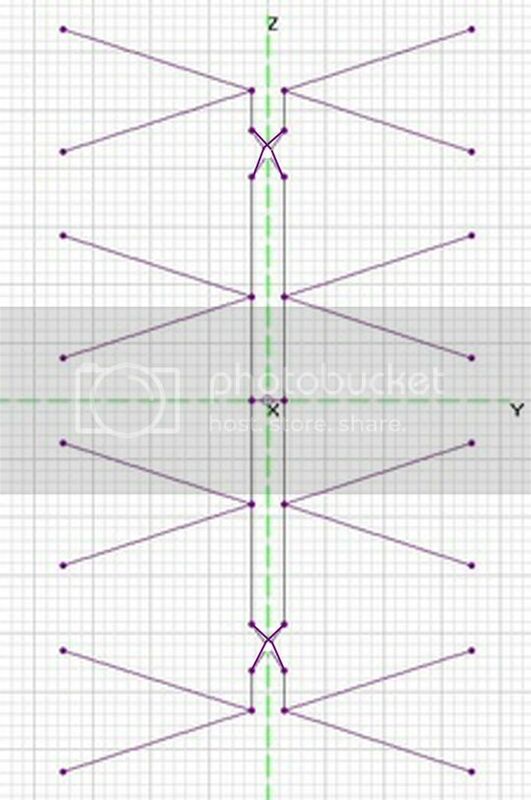 Yes, the video shows the "phasing" wire, I suppose you call them, connecting the bowties: at the top they cross, then in the middle section they run parallel not crossing, then for the bottom section they cross again. Then he takes off the signal from the very bottom. That makes no sense. Need to take off the signal from in the middle, where those wires are running parallel. Right? I just moved the balun to the middle. Right now, the signal is very good (95-100 on the signal strength scale) on all except ch. 55, which has no picture at all. But the wind isn't blowing at all now, I'll have to live with it for a bit and see how it does. I pointed it at about 230°. are these *all* the channels you get? Because with that tvfool & those signal strengths & patterns I'd expect to see a lot more. And if you are aiming at 230, then channel 55 is in a null in the antenna's receiving pattern. To get channel 55 (real channel 50) you're going to need to point the antenna further to the west. The challenge will be to keep the other channels. A two antenna system could help you. A high VHF antenna pointed toward 230 (244 from magnetic north) and a bow tie pointed further to the west to pull in a better signal on 55 while not losing the other UHF channels. I don't think so. Something else is going on here. He should get those with a paper clip in the connector. Have you tried this with just a single piece of known good rg-6 to a single tv? Are their any splitters, combiners or anything else in the equation? Im glad to see another antenna experimenter here. As stated above, the phasing wires and dead-center balun location are critical for your 4-bay to work. The crossed wires should be seperated by 3/4" to 1". I quickly altered the image below (originally from Holl_Ands) to exagerate the right-to-left crossing to establish proper phasing. No matter how the wires are routed 'electrically' it must match the image. You can improve your antennas abilities dramatically if you install a reflector screen on its backside, however, a screen will turn it into a single direction antenna rather than a bi-directional. Edit: be aware that your "signal strength" reports are misleading you. You are actually viewing the signal quality and the higher the better ... BUT ... a weak clean signal always trumps a high-level noisy signal. I dependably receive a channel 75 miles from me and its signals are only vapors, however, its 'quality' is usually around 85. What's confusing you is these are all virtual channel numbers that you've listed -- the channel numbers that show up on your TV cause the FCC lets them lie about the real channels they're using, which are listed (oddly enough) in the the TVF report as Real. The posters here tend to use real channel numbers. Real channels 2 through 13 are VHF and 14 through 51 are UHF. You need a much longer or bigger antenna to catch the lower VHF signals. :applause: Success! I'm sure you'll get something up and running without spending a fortune. Well, 55 is over 60 degrees away from your main crop of signals. You might need to experiment with aiming, as others have suggested, or even a second antenna, if it's crucial to your entertainment lineup. Wind shouldn't have much effect. Rain could coat the leaves in all those trees and make a difference. Yes, but that was before he moved the balun, right Iaskalot? 7:45 Oh nooooooo! He's going to put the balun BELOW the bottom bowtie!? 8:30 "It's called a bidirectional antenna." Right! He's got no reflector on the thing. I think iaskalottaquestions should consider getting a reflector. Nearly all his signals come from 244 magnetic, and the three from 137 degrees are only 4 miles away -- they might plow in right through a wire mesh. At least WNYT will get through. My main reaction to the video: "Man, am I ever glad *I* didn't do all that work!" There's a 4 bay for $30 with a reflector. Thanks, everyone! Still great reception this morning...I hope I'm not being premature, but moving the balun seems to have solved the problem. I'll still have to see how the wind & weather affect the situation. dkreichen & tonyp: I'll experiment a little with the direction, when I can get up on the roof varies because I don't go up unless someone else is home! (You know, to pick up the pieces in the event of a tragedy!) Right now, I have two long pieces of cable <60 feet, I don't know the type without checking, going to a single TV. Fringe: The feature I have to check the signal is labeled "Signal Level", so that's all I have to go by. Amazing how that one little fix makes such a difference, and I'm a big fan of the price. At times, several channels could become unwatchable with all the freezes and cut-outs. Rickideemus: I'll do another channel scan to see what I get. I may experiment with a reflector, but for now I'm just glad to be back in business. Wish I had realized about a $30 bow tie before going to the work of building one, but it was a fun little project. At least now I've gained a little knowledge and become aware of more info resources. As I mentioned, I don't watch much - just some PBS and a few retro shows. But I was very motivated by my wife, who has a number of favorite shows!